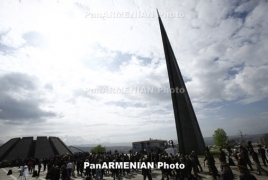 PanARMENIAN.Net - The Lower House of Italy's parliament on Wednesday, April 10 approved a motion calling on the Italian government to "officially recognise the Armenian Genocide" and raise the profile of the issue at the international level, ANSA reports. The motion was approved with 382 votes in favour, none against and 43 abstentions by MPs from the opposition, centre-right Forza Italia party. "With a criminal delay, Italy is finally recognizing one of the most sinister pages in the history of mankind. No economic or diplomatic logic would ever allow us not to state the exact name of the massacre of innocent people. It was a genocide and so it should be written in history textbooks", Massimiliano Capitanio, the lawmaker from the ruling right-wing Lega party, who heads the Italian-Armenian inter-parliamentary friendship group, said after the vote. Turkey’s Foreign Ministry on Thursday condemned the passing of the motion, dismissing it as "a new example of the use of Armenian claims as a tool for domestic political interest". The meeting of Armenian Prime Minister Nikol Pashinyan and Azerbaijani President Ilham Aliyev has begun in Vienna.